It’s tamale season! As a little girl, I dreaded this time of the year. There weren’t visions of sugar plumbs dancing in my Mexican head. There were kitchen nightmares ahead (minus Gordon Ramsey). If I dared to cross the kitchen, I was handed a knife and a corn husk. Smear. Fill. Wrap. Repeat. One day, I saw my older cousin going through the front room, completely avoiding the kitchen, and finding her way to our neighbor’s kitchen who already made tamales. She returned with a bag full of cooked tamales from the neighbor, thereby making herself the hero of our family because ours were still cooking. 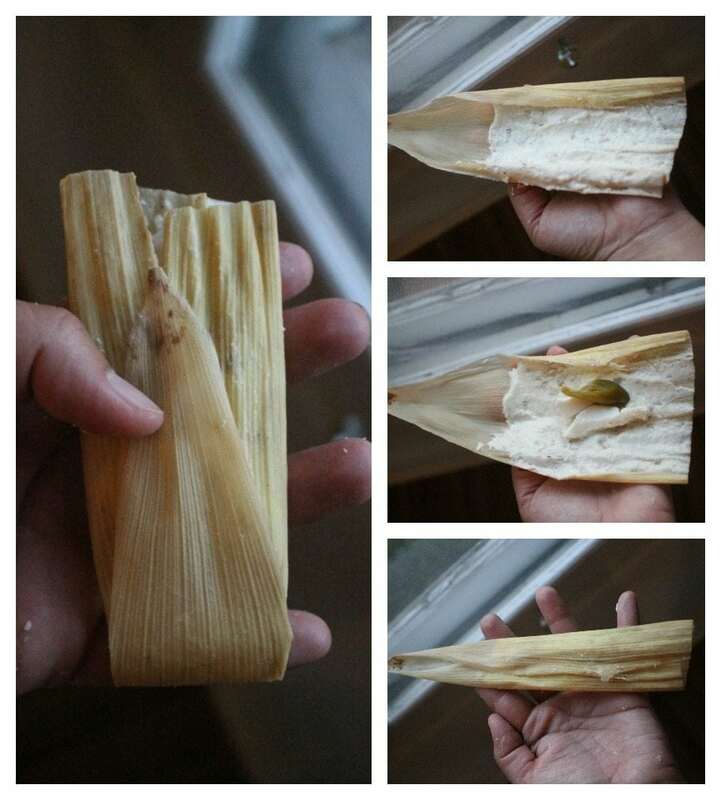 A few years later, my cousin was sitting at the table … smearing, filling, wrapping… when, this time, I walked in with the neighbor’s Tamales de Rajas con Queso. Translation: Jalapeño and Cheese Tamales. 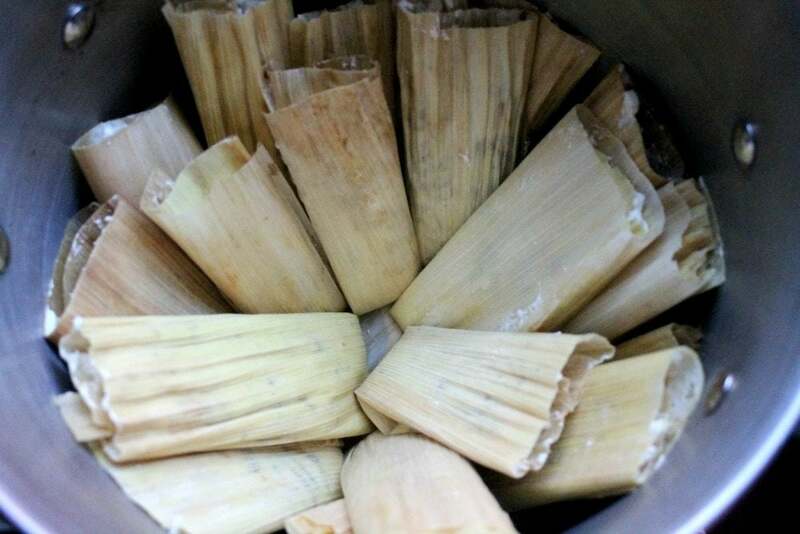 Here’s a tried and true tamales recipe that’s delicious, yummy, and one of the most classic Mexican dishes. It’s not the tamales recipe. It’s the work involved that makes them hard. Truth be told. That’s actually why we have big Mexican families: to wrap tamales. You start by soaking the corn husks in warm water. At least 20 minutes. I usually put a large pot lid on top of the soaking corn husks because they will float. In a large bowl, combine the masa with the hot water. Get a corn husk and apply a thin layer of masa. Fold the corner end in and set aside. When you buy a bag of corn husks, you will always find some that are NOT good. Maybe they are too small, or they just look weird. Add those to the bottom of a large stock pot or steamer, if using. Add tamales open side up. Add water to fill the pot several inches. 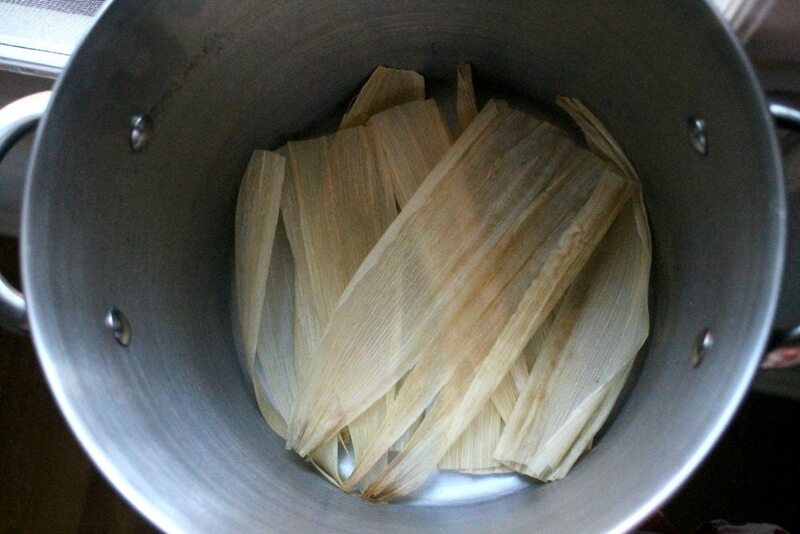 Steam for 1 /2 to 2 hours or until the masa removes easily from the corn husk. 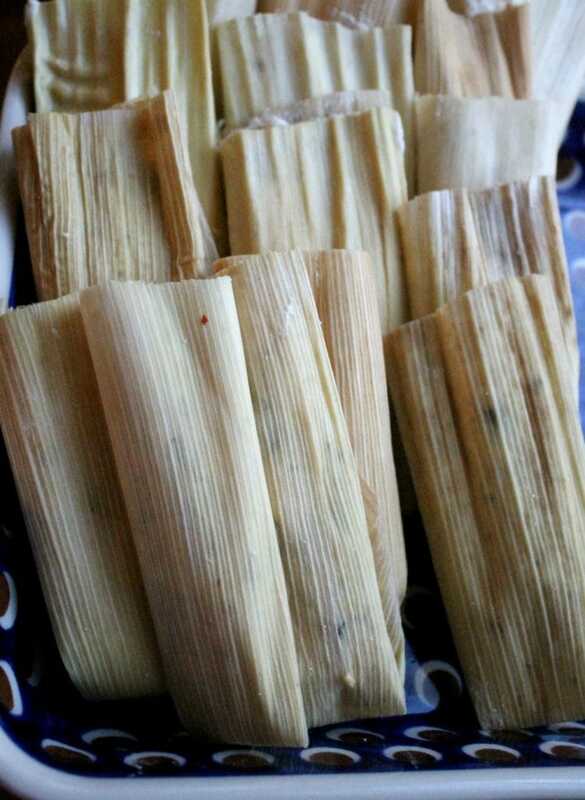 Tamales Recipe: Rajas con Queso, or Jalapeño and Cheese Tamales - this classic and yummy dish is a Mexican food favorite. Soak corn husks in hot water for 1 hour. Apply a thin layer of masa. Add your a slice of Jalapeño pepper. You will always have corn husks that are NOT good. Add those to the bottom of a large stock pot or steamer, if using. Add tamales open side up to the bottom of the pot. Add water to fill the pot several inches. Steam for 1 /2 to 2 hours or until the masa removes easily from the corn husk. I’ve never been brave enough to make tamales myself. I buy them from a woman at the local farmers market. But maybe this year I’ll give it a go! You must! All you need is a few of your favorite friends. Making tamales is a lot of fun! I’ve always wanted to make tamales but I’m intimidated by them. These look delicious–I need to overcome my fear! I have a friend whose mother makes them when she comes to visit and I always look forward to them. You just can’t beat the incredible taste of homemade. 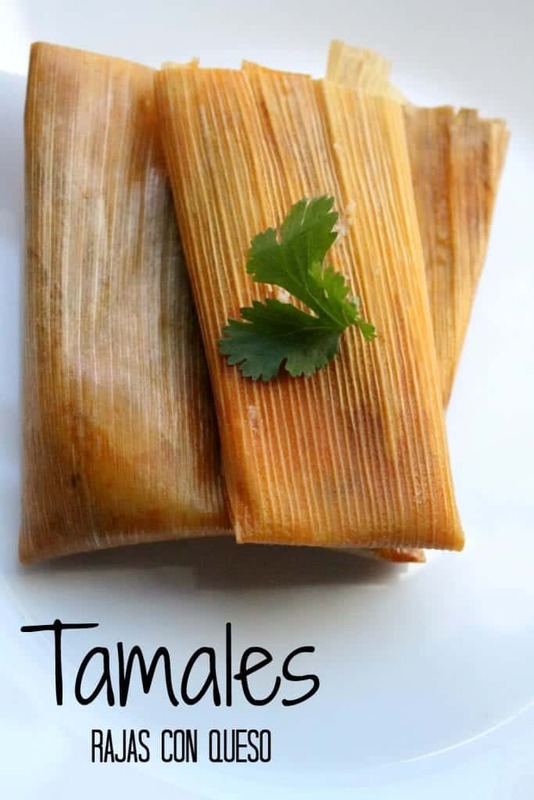 I’ve never made tamales before but would love to. Definitely bookmarking your recipe, they look and sound fantastic! 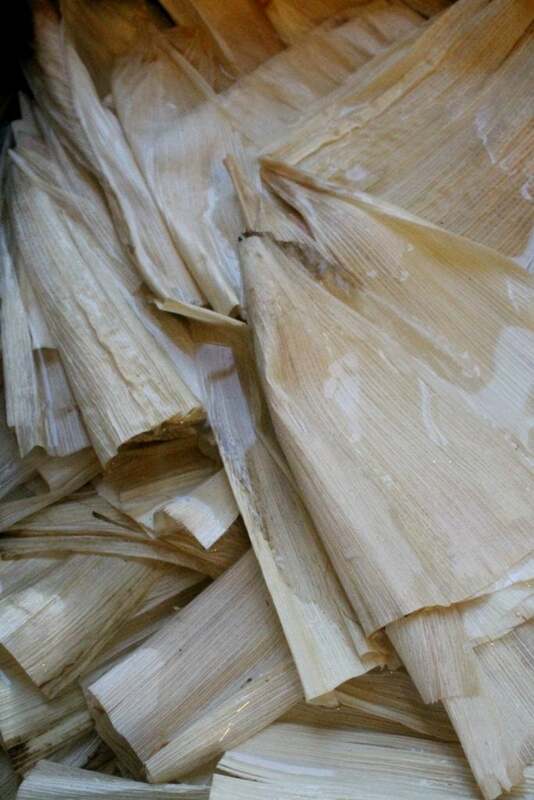 Is it sad to say as a self-proclaimed foodie, I have yet to try tamales?! I know, I know! It’s definitely on the list and this recipe only confirms I need to do so sooner than later. Your recipe looks awesome! OMG! You’re so missing out! I can’t imagine one Christmas without them. So yummy! Tamales are my absolute fave! I’ll have to try this recipe! Ingredients call for baking powder and the directions say baking soda. Which is it? Yikes! I just saw your comment. It went into spam. BAKING POWDER! Thanks for letting me know. If measuring how much is a 1/2 pound of lard? Like a cup? I’m self employed and always short of time. Can I make he Masa the night before and refrigerate it? I have been looking for a recipe for sweet tamales, made with condensed milk and raisins.